The current location that is being used as the common corner for these sections was originally established by S.K. Miller –Walton County surveyor in 1926 (see 1) Mr. Miller does not find a BLM monument or any form of monumentation, nor does he retrace the BLM steps with his survey work. He places monumentation for the subdivision, and establishes a section corner rather than recovering the original corner. This corner location comes into question through litigation in 1957 with case # 7120 (see 3) Armstrong Cork Company vs. Silcox and Thomason. The Judge states that “the court is of the opinion that plaintiff has failed to establish by a preponderance of the evidence, as was its burden, the correctness of the line relied upon – the Cook survey- rather than the line contended for by the defendants- the Edwards survey”(see page 5 – final decree). The Plaintiff petitioned for a rehearing of the cause, “and prays that the court will designate another surveyor or surveyors to revisit the SW corner of 14 (SE corner of 15) to “take the necessary technical steps to fix the north and south lines based on that corner, which is established by all of the testimony as being correct ”(see page 6). The motion for a rehearing was denied, and the problem continues for other generations as a result. The transcript from the above referenced case was filed in 1958 in Walton County, and became part of a review with the Court of Appeals of the First Appellate District of Florida in 1958. A Mandate issued on Oct. 9, 1959 upheld the original ruling and the corner established by Garland Edwards is supported as part of the ruling in Chancery vol. 13 page 306. The transcript of the case contains testimony that reveals neither plaintiff nor defendant had recovered the proper corner location. The surveyor for the plaintiff ACC is J.W. Cook. Cook testifies that he “established” the section line between sections 10, 11, 14 and 15 (see page 12). The surveyor for the defendants is Garland Edwards, who is also identified as the County Surveyor (see pg. 33). Edwards testifies that he “ ran on the meridian line between two proven points. This area in here was laid out on a variation of 3 degrees”. He states “the government field notes called for 6 degrees 10 minutes or 6 degrees 20 minutes. That is approximately 3 degrees”(see pg. 37). Edwards testifies that he has “proven every corner in Section 15” (see pg. 40). Edwards testifies that Section 15 was “surveyed by Stephens and accepted by the county as official”(see pg. 42). He continues to identify the Plan of the Town of Freeport, as surveyed and platted by W.J. Stephens, Deputy U.S. Surveyor (see pg 43). Edwards testifies “I ran from the ½ mile post on the north line of 15 2640 feet east on a true latitudinal line as I found it, which is a variation of 3 degrees east. I found the section corner and proved it…” (see pg. 43) He states “ I orient my instrument to the north-south meridian which in this case was a north 3 degree east on the needle” (see pg. 51) and “I ran from the north 87 degree east on the needle” (see pg. 54) and “north 87 east magnetic” (see pg. 56), and “I started at the middle point of the north line of 15 and ran east 87 degrees north…” (see pg. 68). John Sims is introduced as a witness for the plaintiff, and is identified as a civil engineer and registered surveyor hired by ACC to check both corners in dispute (see pgs. 89- 90). Sims testifies that “looking around we did not find anything other than the two corners and one old squared lightwood stake that was so far off that we discounted it” (see pg. 93). Because ACC was unable to prove the correct corner location, the other corner location (established by Garland Edwards going the wrong direction) was upheld, even though it was not proven to be correct either. This ruling helped perpetuate the ripple effect that seems to be involved with this current litigation. The points identified in the ACC case are important to the defendant’s current case in several ways. 1. It shows a significant difference between 2 corner locations placed, not retraced by the surveyors involved. 2. Garland Edwards –Walton County Surveyor- testifies that he has proven every corner in Section 15. Mr. Odom may be using one of Edwards corners. 3. Garland Edwards testifies several times that he used a north 3 degree east bearing from the middle point of the north line of 15 and travelling east to establish his NE corner of 15. He should have been travelling southeast to retrace the original BLM steps, and was clearly going the wrong direction when compared to the bearings identified with the 1826 survey of the township. If Edwards went the wrong direction to establish the NE corner of 15, it’s a real possibility that he took the wrong direction to establish the NW corner, the SE corner, and the SW corner of 15 – which happens to be the corner at issue in this current litigation. 4. Garland Edwards testifies to the validity of the Plan of the Town of Freeport, as surveyed and platted by W.J. Stephens, Deputy U.S. Surveyor. Research has shown that Stephens was approved to do work as a Deputy U.S. Surveyor, and was offered a job once by the Federal Government. Stephens requested more money to be able to do the job, and was denied the request. He was never offered another opportunity to work for the Government, and had no right to ever sign any document in an official capacity unless requested by the Federal Government. In 1901, he drafts a plat of existing boundaries within section 15. The original unsigned cloth survey is housed with the Tax Appraiser’s office in the “Unrecorded plats” file. Unrecorded plats, according to the tax appraiser’s office, are document, plats, and surveys that do not meet the criteria to be filed as an official document. Somehow, this document became “Official” because you can obtain copies of it at the Walton County Clerk of Courts office. The version at the Clerk of Courts office differs from the original in that it is signed ”W.J. Stephens U.S. Duputy Surveyor”. The tax appraiser Patrick Pilcher, had another version hanging on the wall in his office, which was on loan from a friend. This version is signed (in different handwriting) W.J. Stephens U.S. Deputy Surveyor. This document in its various versions, does not give measurements to the locate or confirm any of the corners of Section 15, but has become heavily relied upon by landowners and surveyors - to include the Walton County Surveyor, Garland Edwards. 5. John Sims testifies that when checking the area “We did not find anything other than the two corners and one old squared lightwood stake that was so far off that we discounted it”. There is a good chance the lightwood stake was an original BLM corner. These are the same types of measurement discrepancies that occur in other parts of the township, and the monumentation that is ignored or discounted over time because they are so far off from corners that are established, and not retraced by surveyors. Several attempts to locate files, surveys, and any information on work done by the Walton County Surveyors office have been made. There is no record or knowledge of the past surveyors anywhere to be found. We are especially interested in work done by S.K. Miller and Garland Edwards, since their work includes lands and establishing corners in Freeport, according to the few public records that have been found (see 1 and 2 case #7120). In 1901 a Survey appears in the “Plats Section” of the public record of Walton County. We use the word “appears” because the Clerk can not say who recorded this Survey or what day or even what year it appears at the county courthouse. Known as the Plan of Town of Freeport in Walton County, Florida, this document was surveyed and platted by W.J.Stephens - Duputy U.S. Surveyor. The copy shown on this site is a certified copy from the public records office at the Walton County Clerk of Courts. This is also regarded as a valid document with the City of Freeport and kept in the files of the city. The survey shows 1 square mile of section 15 of T1S 19W. The locally official map does not identify section corners, indicate directions, bearings, or tie into the TRS grid as established by the Federal Government. This is a required fundamental element to satisfy the U.S. Survey Generals manual of instructions to all Official Deputy Surveyors when producing official dependent re-surveys . The document is not properly filed in the official records of Walton county, yet this survey appears in the official paper record files, is still used today, is referenced in hundreds of deeds and surveys, and can be purchased as a certified copy from the Clerk of Courts office. Some of the deeds mentioned cite a specific public record book and page number of Plat Book 2 page 64. The document is not filed in Plat Book 2 page 64, which indicates that it may possibly have been pulled at some point from the public records. This survey continues to have more consideration of importance than most surveys in Walton County. There are no copies of any of the BLM established TRS grids to be found in the Walton county or City of Freeport records. 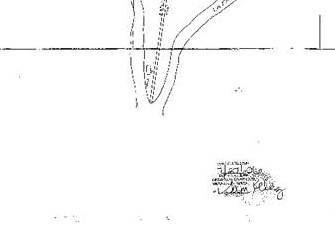 Note the point where Lafayette creek and Four mile creek join is shown south of the section line on Steven's survey when compared to the original survey done by the BLM. The effect of the section line location is that the whole of Section 15 has moved north. There is a scale on the survey where 1 inch equals 200 feet, so it is possible to calculate that this move amounts to nearly a 400 hundred feet difference! Mr. Stephens signs the survey identifying himself as a Deputy United States Surveyor. This would suggest that the survey was an official “dependent” re-survey of this section done by or for the BLM. No wait, that's "Duputy" - a Freudian slip. The GLO & BLM keep their own records which have been unaffected by local fires, so we were able to learn the following about this survey and the man who made it. The Federal records indicate that Mr. Stevens applied for a position as a GLO surveyor and had his survey equipment verified as adequate by the government for the job. Stevens was offered an opportunity by the government to survey a township, but was not granted the commission due to his request for more money with the task. The Federal record indicates he was never hired by the Federal Government in any capacity what so ever at any time. Therefore he was never an Official Deputy U.S. Surveyor, and was not officially sent to perform a dependent re-survey of Section 15 in 1 South 19 West. This document appears to have been created under a fraudulent guise. There is a blue cloth unsigned version in the unrecorded plats file at the Tax Appraiser’s office. There is a framed paper version that hangs on the office wall of the current Tax Appraiser with a signature of “W.J. Stephens” that appears to be different handwriting than the version of the survey on file at the Clerk of Court’s office. There is a copy of this survey on file at the Freeport City Hall in addition to the copy at the Clerk of Courts office in DeFuniak Springs and one at the South Walton Courthouse Annex. There are no copies of any of the TRS grids on file with any of the Government agencies listed. Miller notes that he placed all of the reference monuments used in his survey including the point of beginning (POB). He does not indicate that there was any existing monumentation at the point of beginning (POB.) Miller does not indicate how or if he tied Into the TRS Grid before setting his POB. There is no reference to finding any type of pre existing Federal TRS monumentation near the section corner location he ultimately set to start from. Miller begins his description of the land mass surveyed in this way: “Beginning at the SE corner of the SE ¼ of section 10, Township 1 south Range 19 west, run west approximately 34 chains 3 ¼ degrees South to Old Eucheanna and Freeport roads, etc…..” However, the Federal TRS survey identifies an East 6 degree 10 minute bearing on the township grid. The bearing runs from west to east at a south 6 degree, 10 minute bearing, verified by Buddy Bannerman - a surveyor whose services are heavily relied upon by the Florida DOT and other agencies. Therefore, S.K. Miller runs his line the wrong direction when compared to the Federal TRS field notes. It is unclear if the line run by Miller was influenced by the survey work done in 1901 by “Duputy” Stephens. It is very probable that this is the case. There is also the question of authority. A County Surveyor must follow the Federal survey, not change it in any way. There is no accuracy or compliance in placing a corner monument where a surveyor thinks it should be, or where it is convenient without finding pre existing Federal monumentation or evidence of witness trees and noting such evidence on the survey that is being created. A section corner must be proven in accordance with the instructions from the Office of the US Surveyor General. reference to "PRM" (placed reference monument) of the Section corner. Surveyors are required by law to find BLM section corners, not place them. "Beginning at the Southeast Corner of the Southeast Quarter of the Southeast Quarter of Section 10.....Run west approximately 34 chains 3 1/4 degrees south..... " This line was shot from east to west at 3 1/4 deg instead of 6 deg. 10 min.